In San Francisco, some of our friends introduced us to a fun game called Settlers of Catan. Since then we've in turn introduced it to many others. It's a great game, but after several years of playing it (and getting sick of Ben winning all the time!) we've moved on to a new game called Ticket to Ride, Europe. My brother-in-law introduced us to the USA version, which we liked, but we LOVE the Europe edition. It's a lot more fun to build a route from Smolensk to Barcelone versus Duluth to Atlanta. 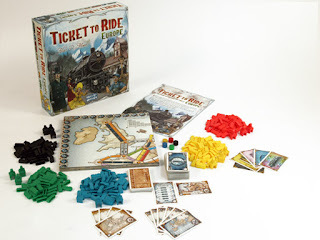 Plus the addition of train stations and tunnels adds a few interesting strategic twists to the game. I'm realizing as I write this post I sound like a total nerd, but I must share this gaming find with all my fellow gamers out there! Our friends Jason & Sara McFarland (a fabulous muralist btw) are not gamers at all and they even loved it. Bottom line, if you're in the market for a new game, this is it. Caveat: Specialty games like this are only available online or in specialty toy/game stores. I played this game the other day at a friends. It is pretty fun and requires more strategy than you think on your first time through.